Fax-It is a desktop faxing add-in you can "drop-into" to any form in any Sesame application. Adding Fax-It to a form does not require any programming knowledge. A fax modem (internal or external) and phone line. One or more fax merge documents you can easily create in Microsoft Word (we show you how and supply samples) or most any other type of file, including Word files, PDF files, Web page files, and so on. A simple Windows script (provided). Fax-it works with the Windows Fax feature that comes with Windows XP. The Fax-It package includes a fully functional sample Sesame database that you can use to familiarize yourself with the way the Fax-It process works. 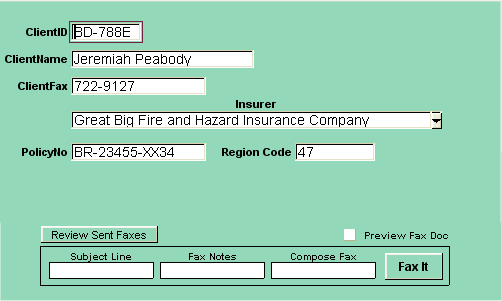 When you're ready to add Fax-It to your own application, you simply use the sample application as a guide for the few fields and buttons you'll need on your form (shown in the sample screen below at the bottom). How many databases or forms can I use Fax-It with? As many as you like. You can add Fax-It to any form in any database. How long does it take to set up Fax-It? Under an hour for someone familiar enough with Sesame Designer to add a few new layout elements to a form. Detailed illustrated instructions in a PDF (Acrobat) document. A fully-functional Fax-It sample application you can play around with to familiarize yourself with how it works. A custom Windows script necessary to run Windows Fax. A free, no obligation Fax-It demonstration is available over the Internet.